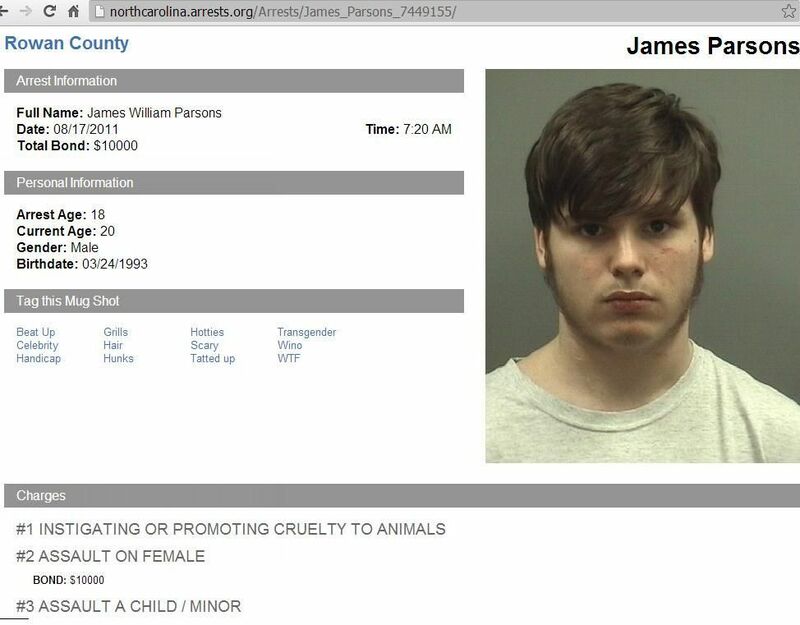 August 17, 2011 Jamie Parsons Arrested For Assaulting a child, a female, cruelty to animal. 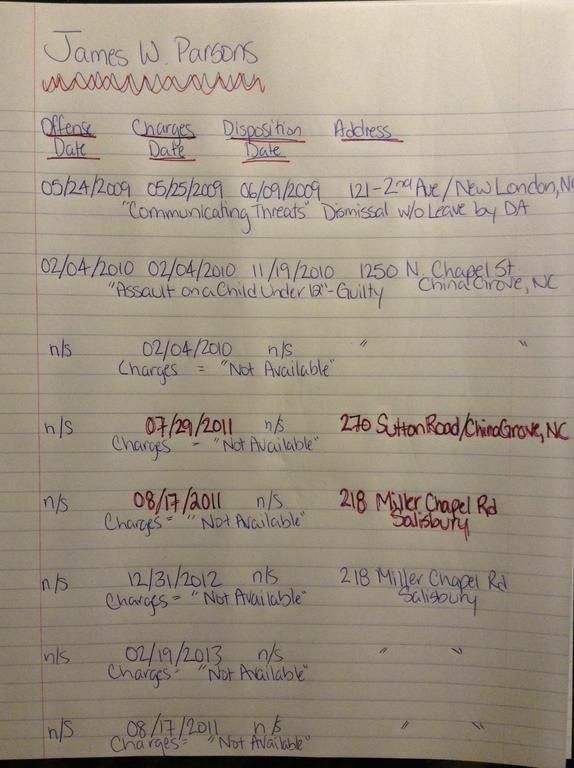 See January 2012 where Casey Parsons explains that all the charges against James "Jamie" Parsons were dropped because Casey failed to show up for court. Report in August 2011, RCSO went to Miller Chapel Road where they say James Parsons assaulted his mother, brother, sister and dog Report was that "James Parsons assaulted his mother, brother and sister and choked his sister’s dog." --- . "The Parsonses have a home-based business, Parsons Kennels, where they breed miniature dachshunds, pugs and hedgehogs, according to their website. The Parsonses have five children — three boys and two girls. Erica was one of three children who were homeschooled. 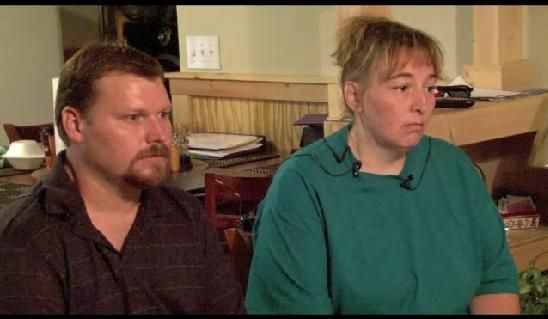 "James Parsons was charged in February 2010 by China Grove Police for misdemeanor simple assault for biting his 3-year-old brother on the arm to “see if he could bring blood to the (surface),” a department report said. 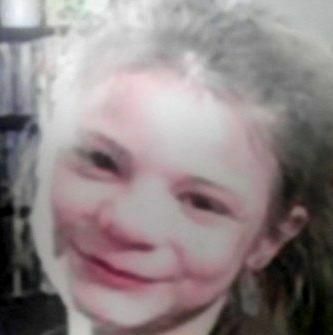 The children’s mother, Casey, called authorities regarding the incident. James Parsons was 16 at the time." 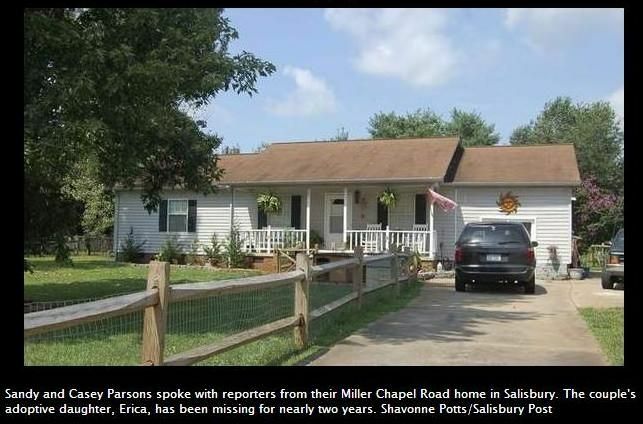 "In August 2011 the Rowan County Sheriff’s Office went out to the Miller Chapel Road home where they say James Parsons assaulted his mother, brother and sister and choked his sister’s dog. It’s not clear if Erica was the sister involved in this incident. Records do not indicate James Parsons was convicted of those charges." Parsons Attorney said Jamie Parsons was arrested Aug 2011, spent 20 days in jail . Reporter: - that she was unhappy here, so much that she wanted to be happy with her grandmother? Casey Parsons: They gave her more stuff than we could, material wise. 'Cause, even here when she would come back in September and November, it would- if we didn't give her the clothes and stuff that she wanted, she would be like, "I'mma call Nan. They'll get it for me." Parsons Attorney: You have to understand at this time, this household was in turmoil over James- he had assaulted her in August of 2011. He had been arrested and spent 20-some days in jail, uh- been released. He had- what- psychological problems? Casey Parsons: Yes, he did. Parsons Attorney: He had to be committed at one point? Casey Parsons: Presbyterian Hospital, yeah.